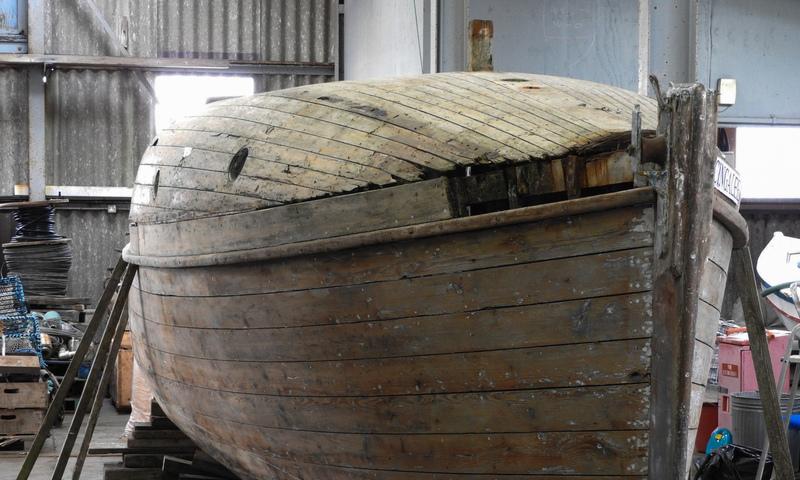 James Rosie (1869 – 1951) built 23 clinker built boats of various sizes up to 30ft during his lifetime on Swona. 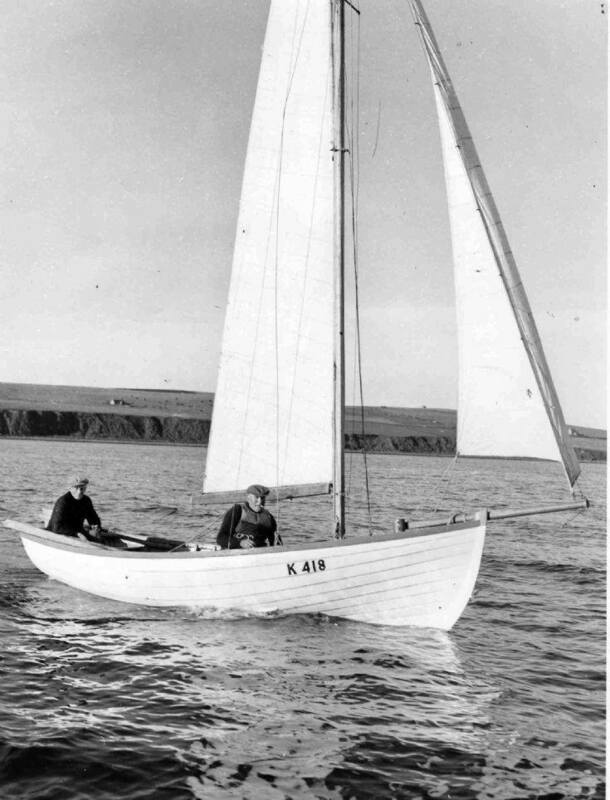 One of these boats was a square-sterned dinghy, Falcon (K418), built in 1927. 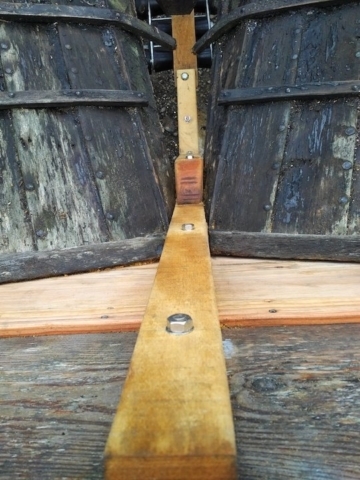 16ft 9ins (5.1m) in length, 7ft 6ins (2.28m) in beam and a depth of 3ft (0.9m). 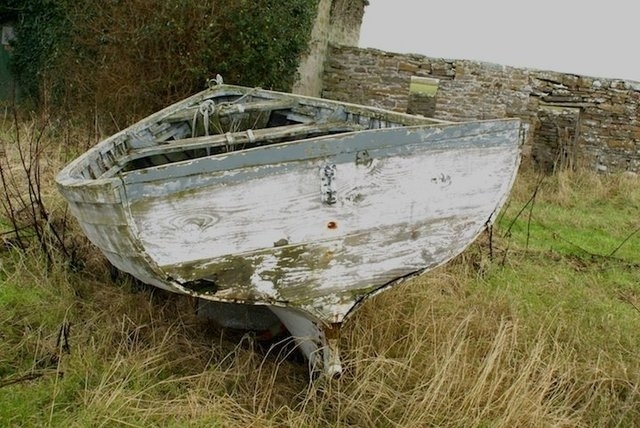 Used for fishing, she was also raced by James’ son, James Rosie Jnr., in regattas at Longhope, Holm, and St Margaret’s Hope, with considerable success. 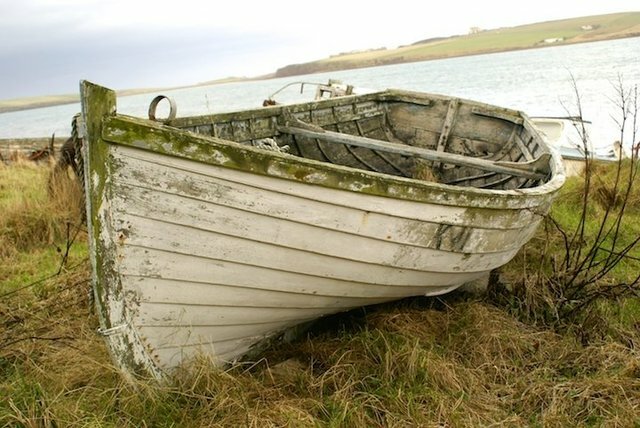 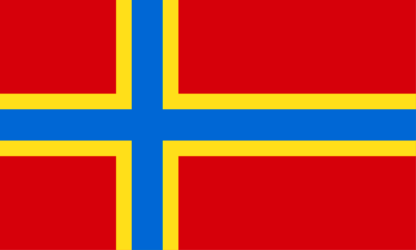 James Rosie lived on the small island of Swona, in the Pentland Firth 4 miles off the coast of South Ronaldsay, Orkney. 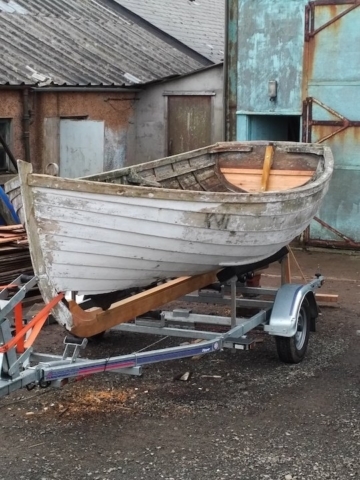 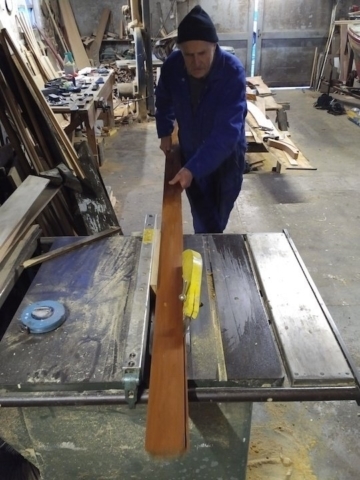 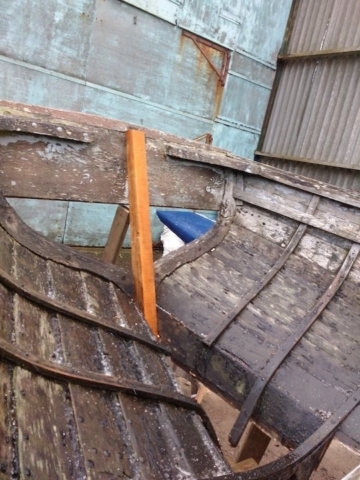 As well as being a crofter and fisherman, James built a total of 23 clinker built boats. 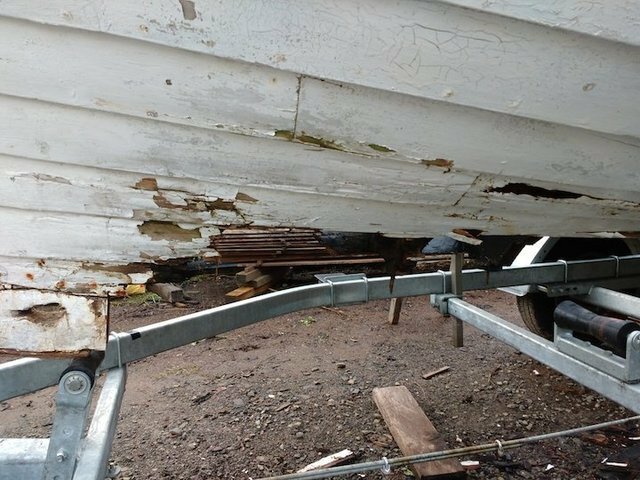 By the early 1970s, the population on Swona had been whittled away until just two ageing residents remained – James Rosie Jnr. and his unmarried sister, Violet Rosie. 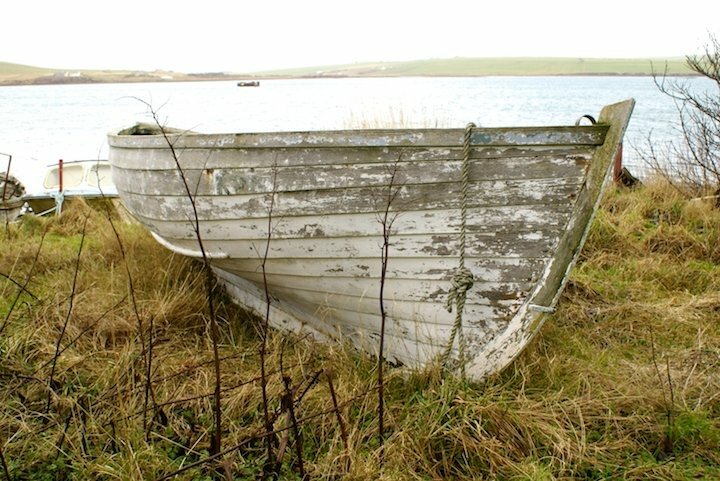 When James was taken ill on a stormy March night in 1974 they left the island, leaving it uninhabited. 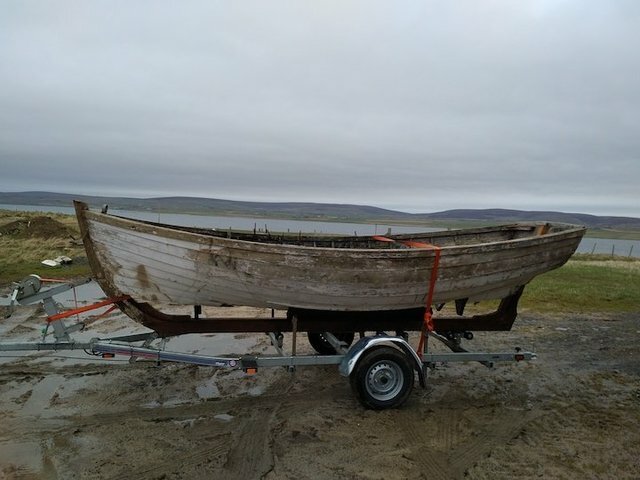 This dinghy, has been a much enjoyed attractive feature at the top of the beach at Herston, South Ronaldsay, Orkney, for many years. 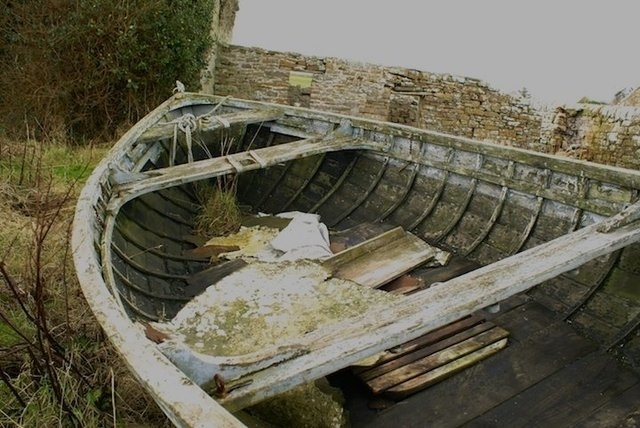 The boat, however, has been deteriorating over the passing years and was getting to the stage where she would be in danger of being lost to the elements forever. 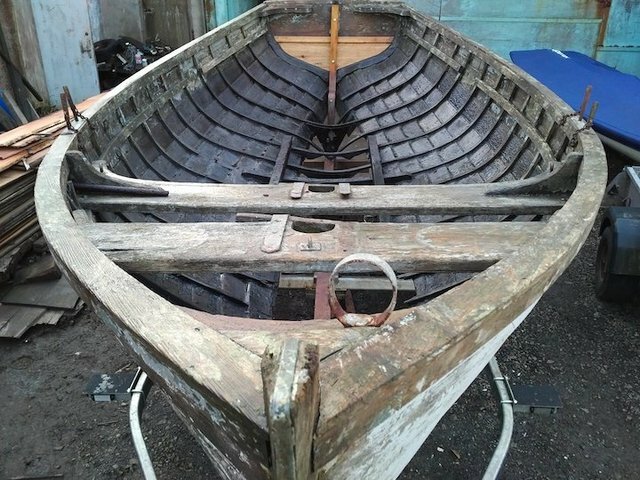 She has been gifted to the OHBS by the owners Cyril and Martin Annal, who are descendants of James Rosie. 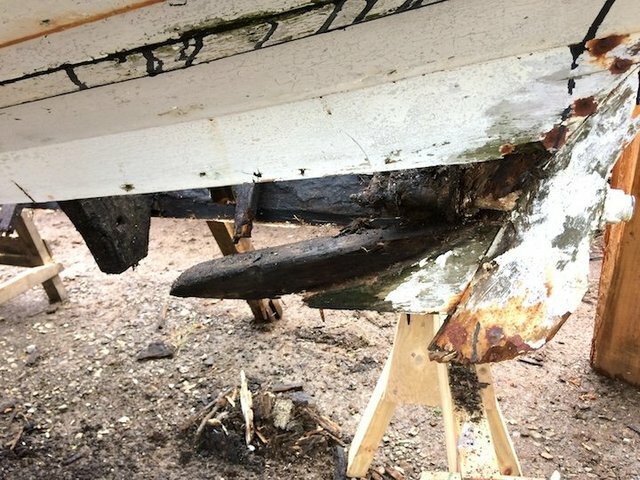 When uplifted, the boat was showing signs of greater deterioration on the keel and lower boards than expected, and she was clearly not many years away from the point of losing structural integrity and being beyond realistic recovery. 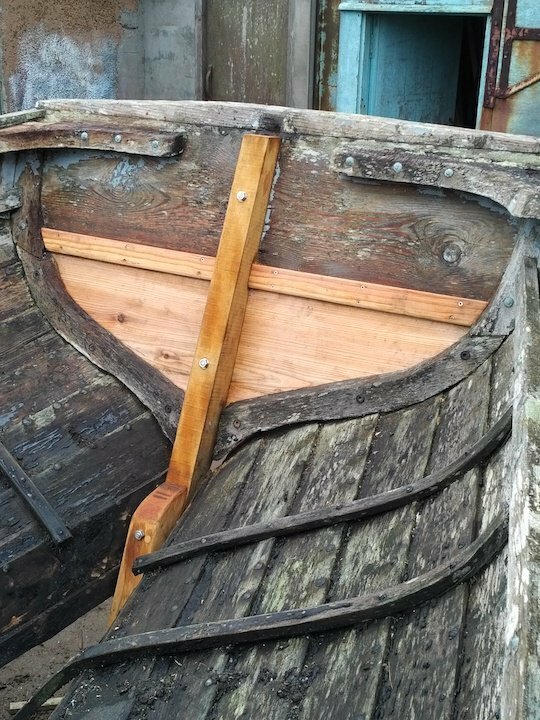 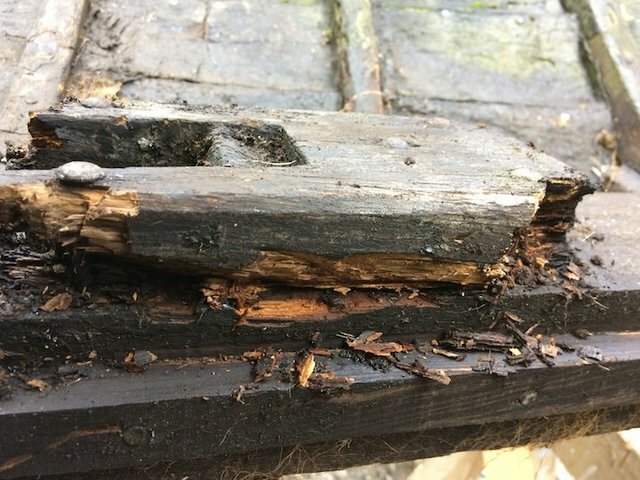 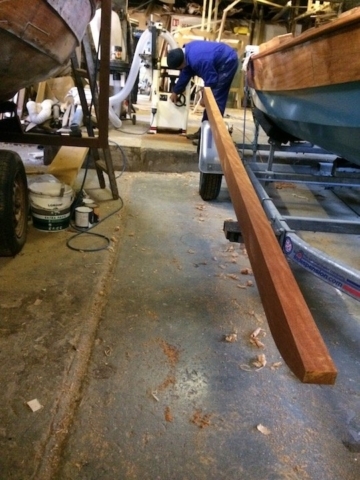 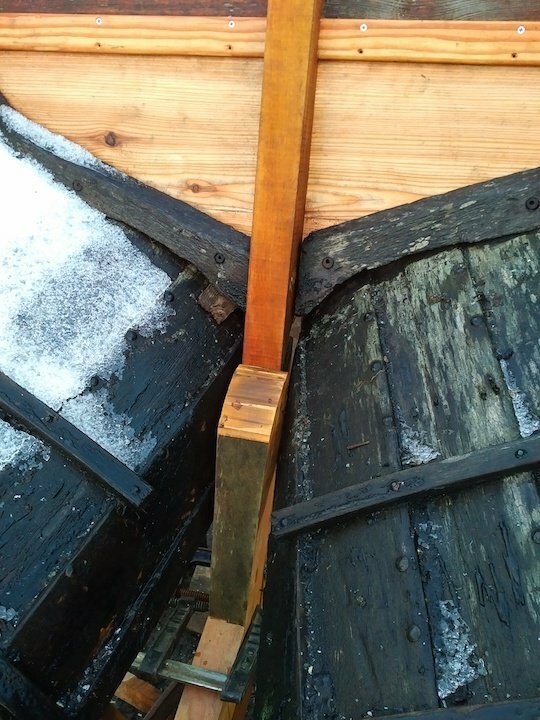 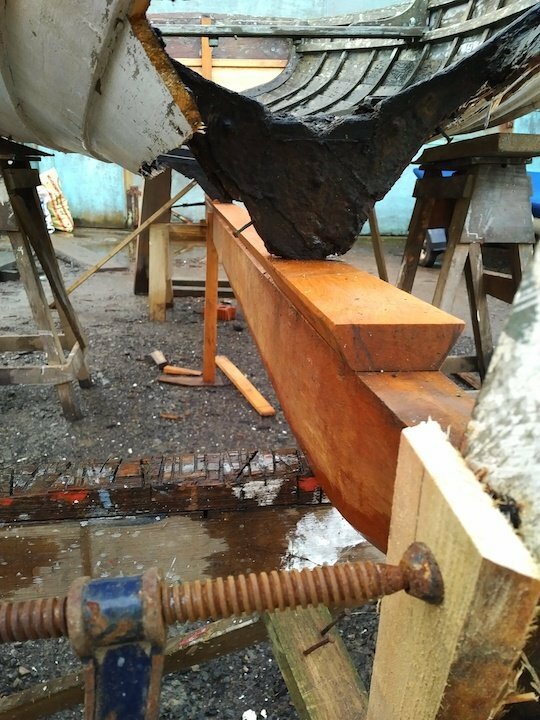 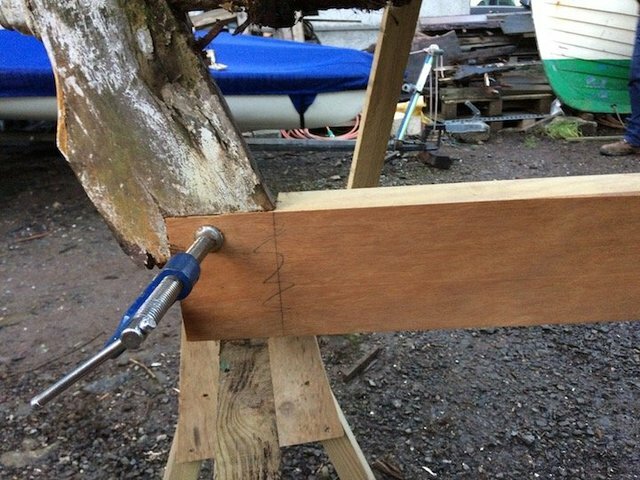 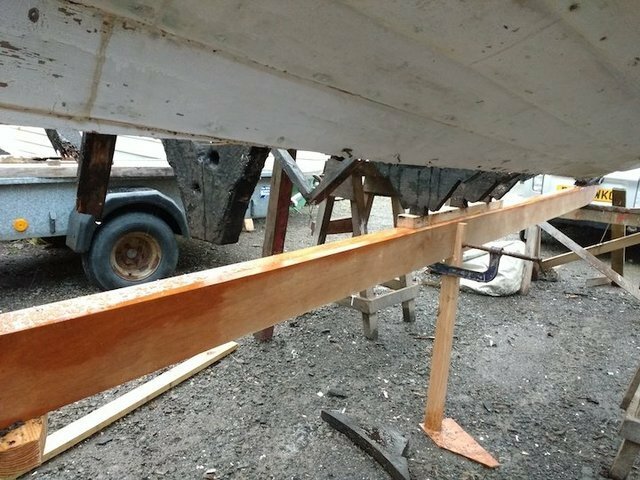 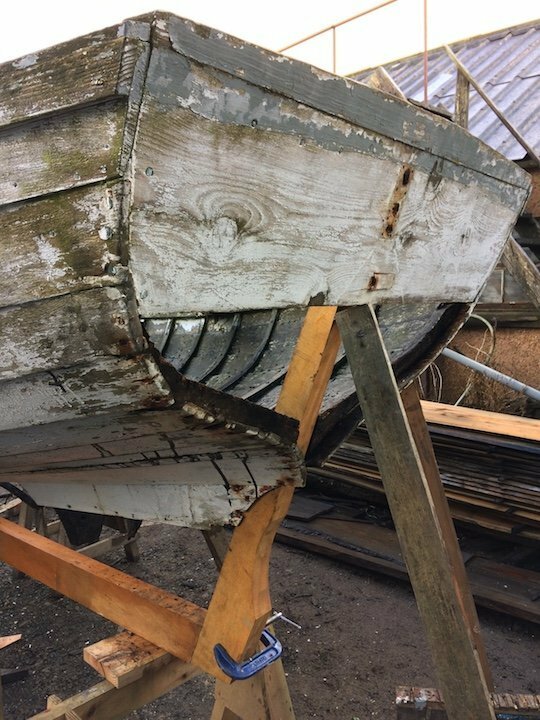 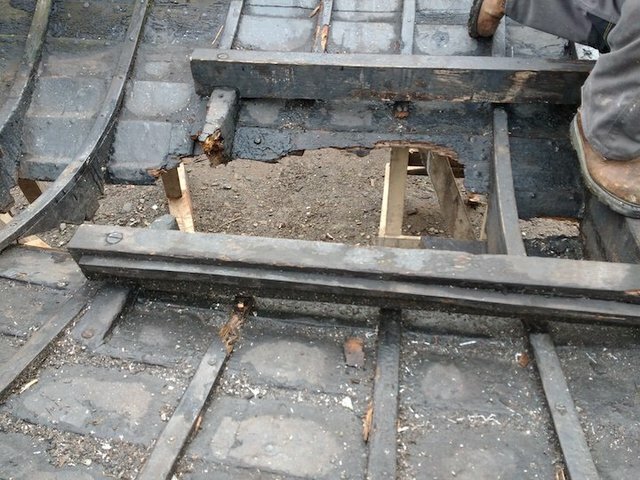 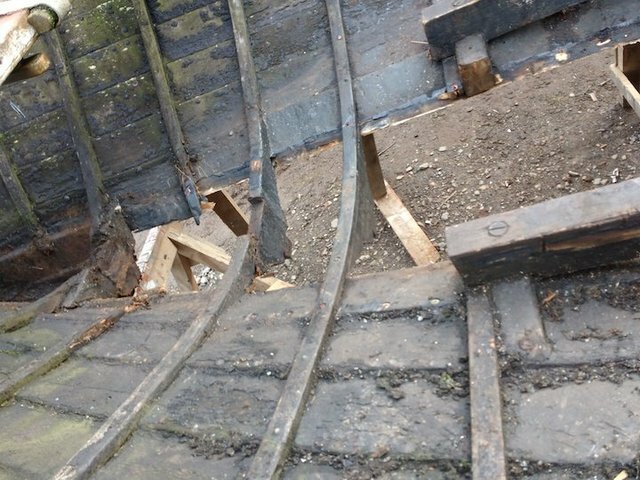 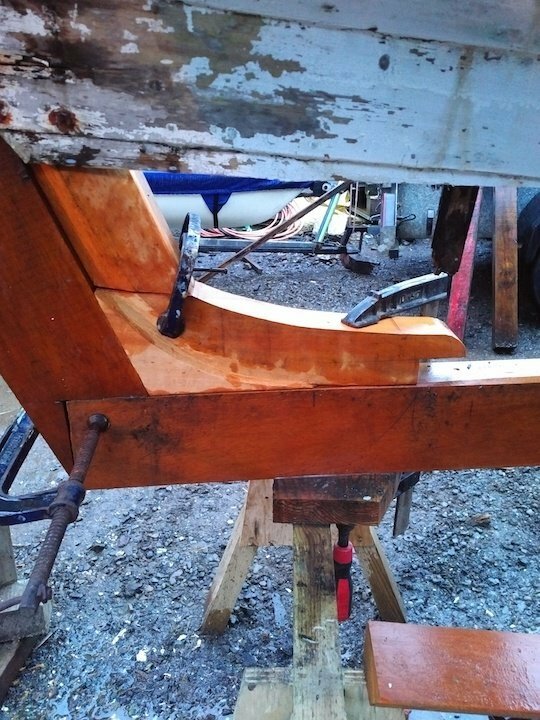 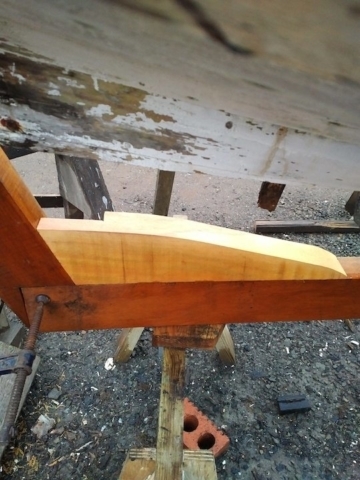 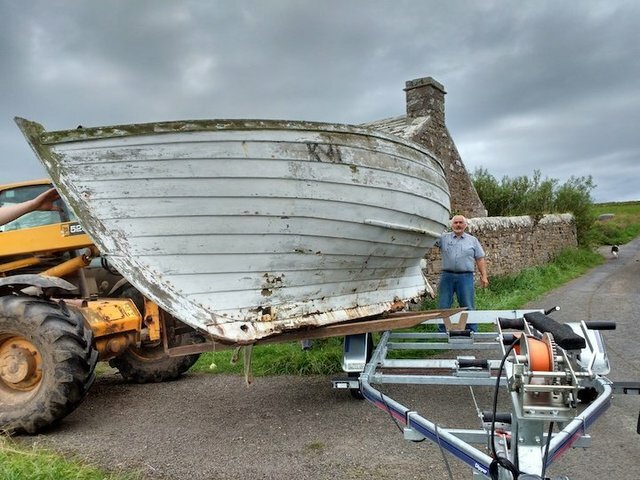 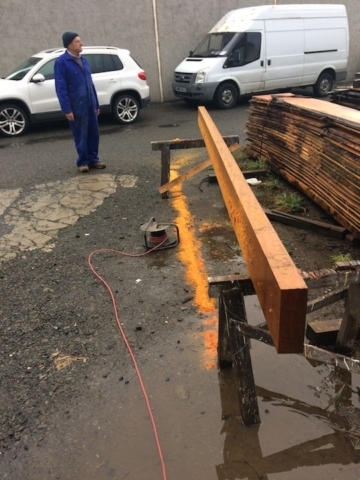 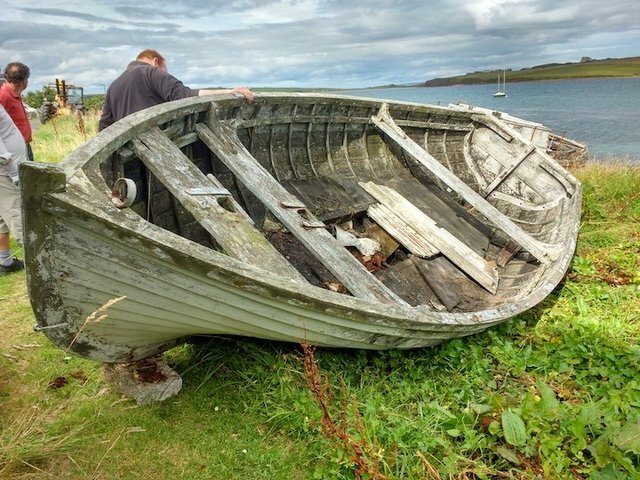 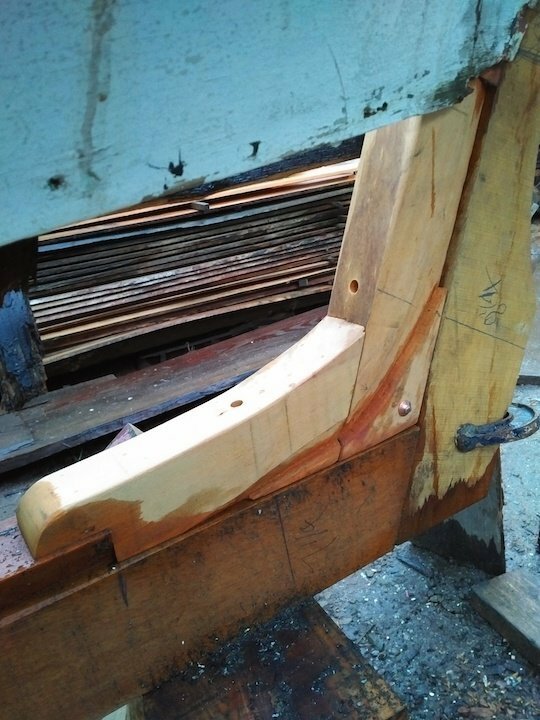 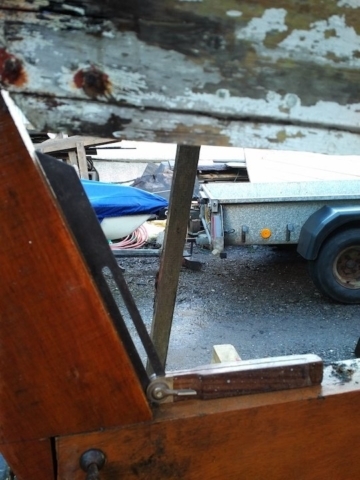 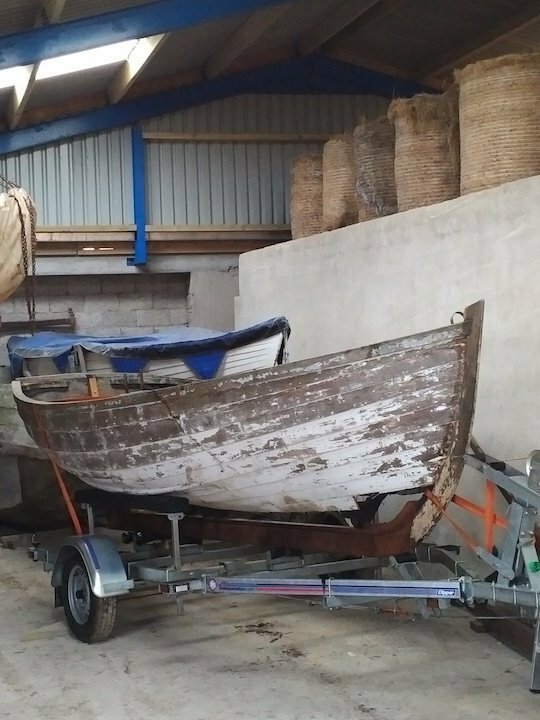 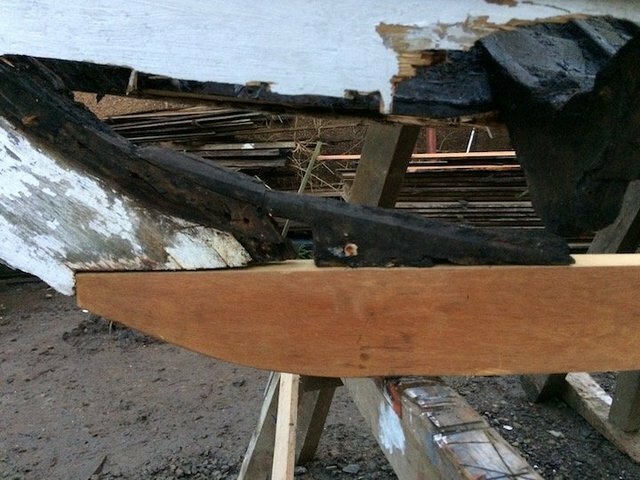 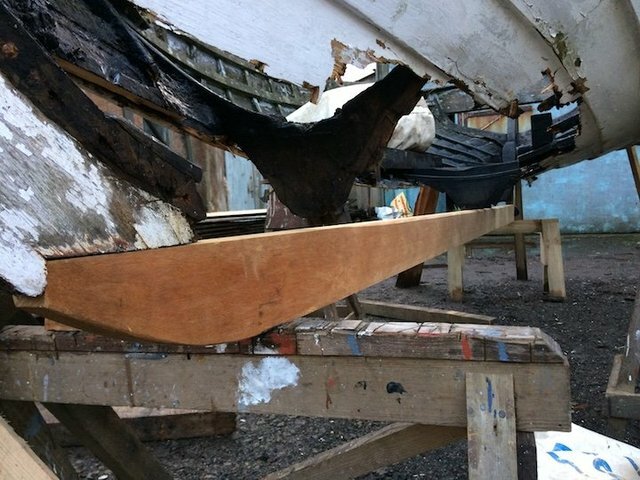 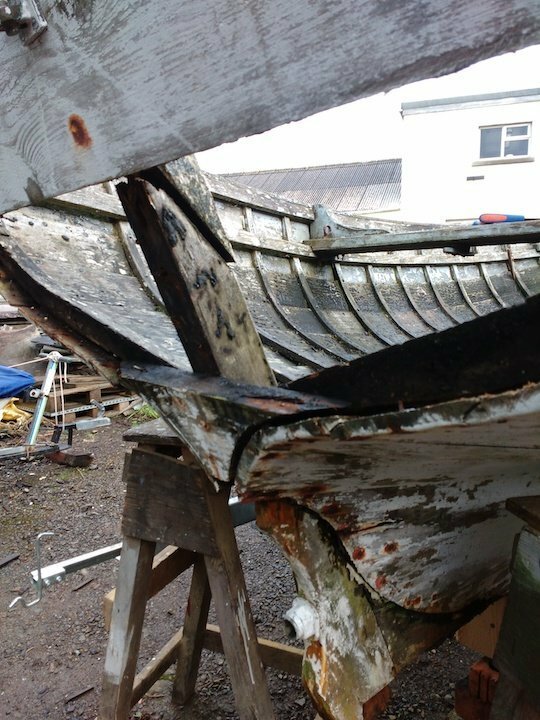 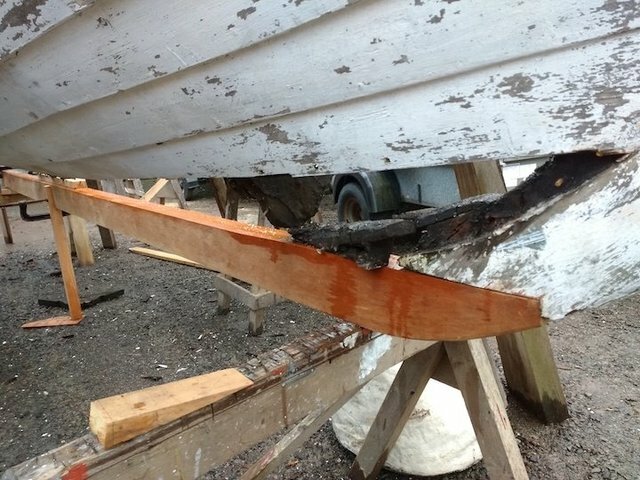 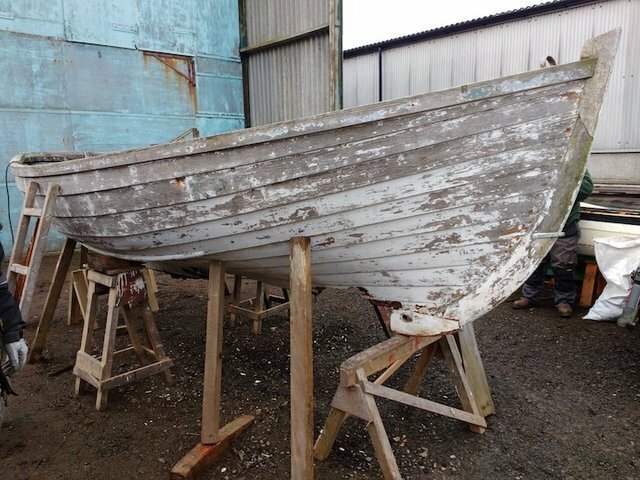 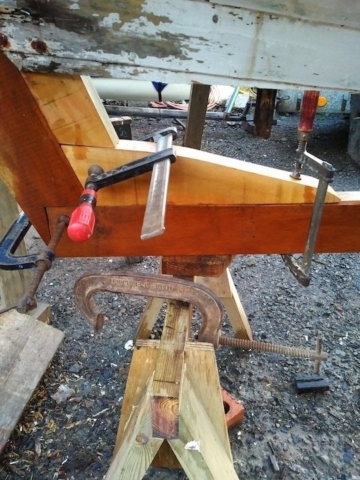 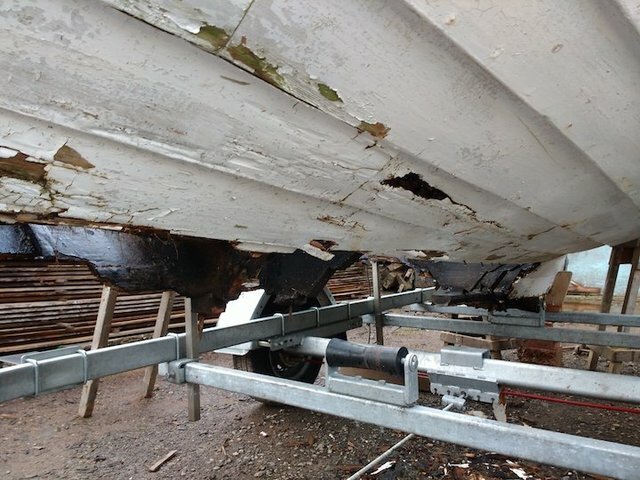 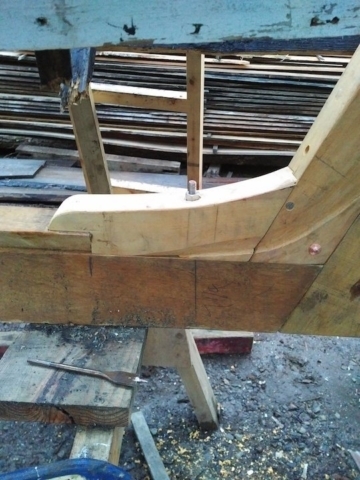 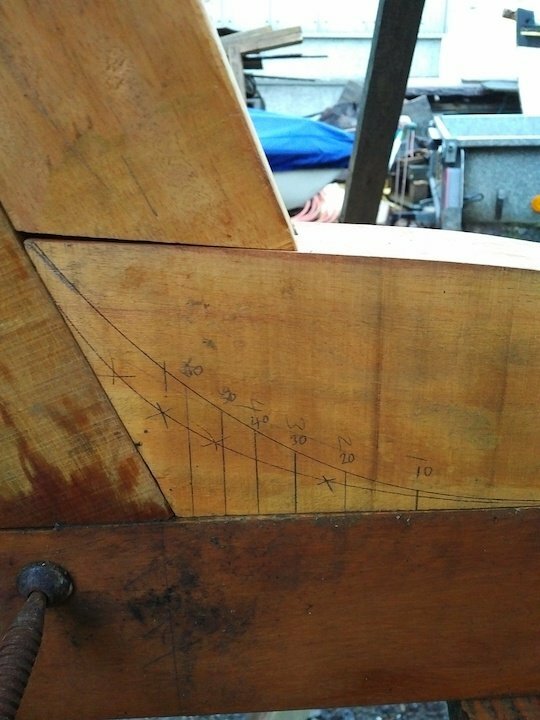 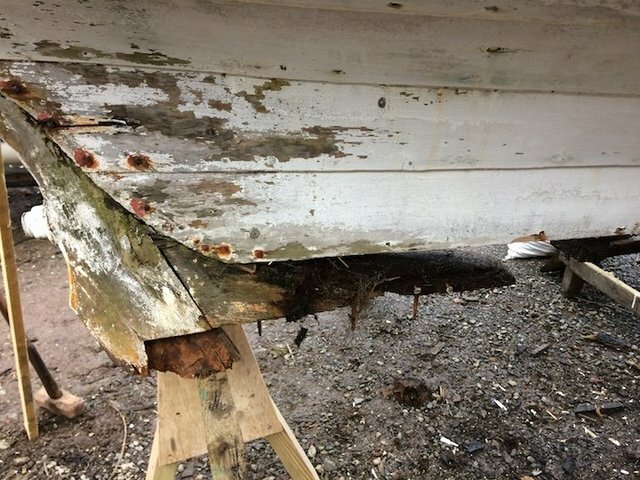 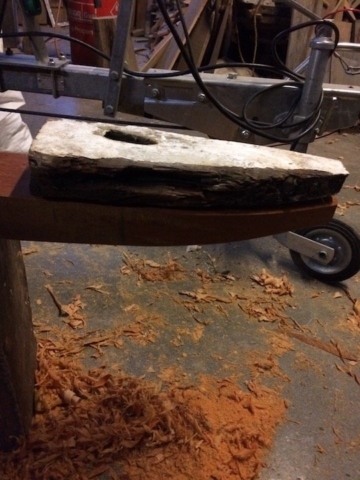 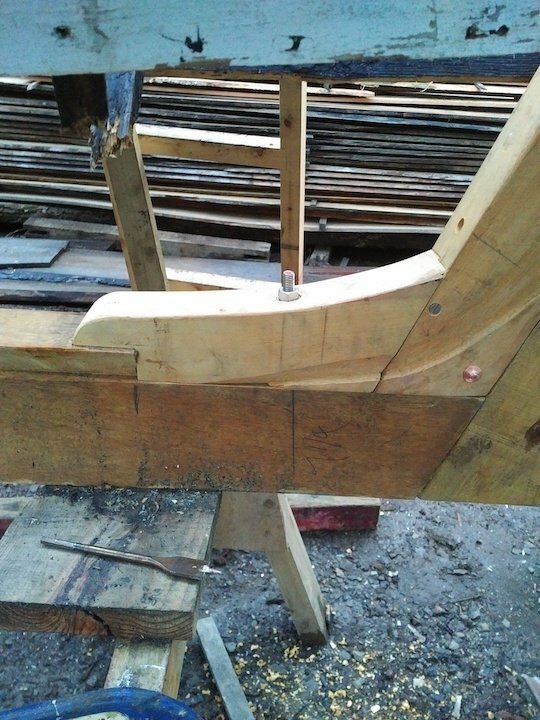 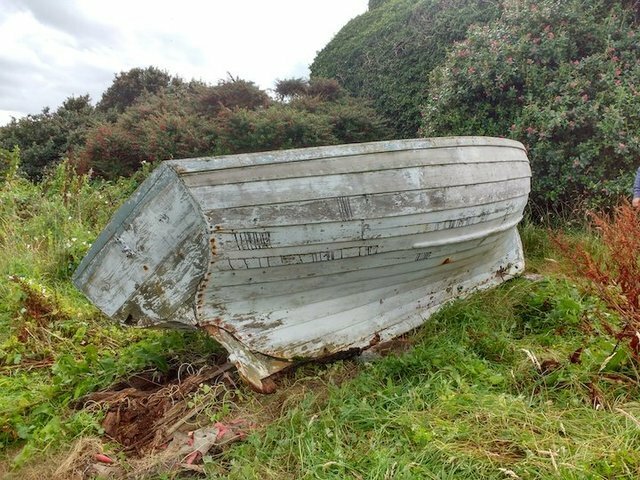 After a detailed survey at the yard of Orkney boatbuilder Ian Richardson, significant rot was found in the keel, deadwoods, garboards and lower strokes, as well as the stern post and lower transom, all of which required to be urgently removed. 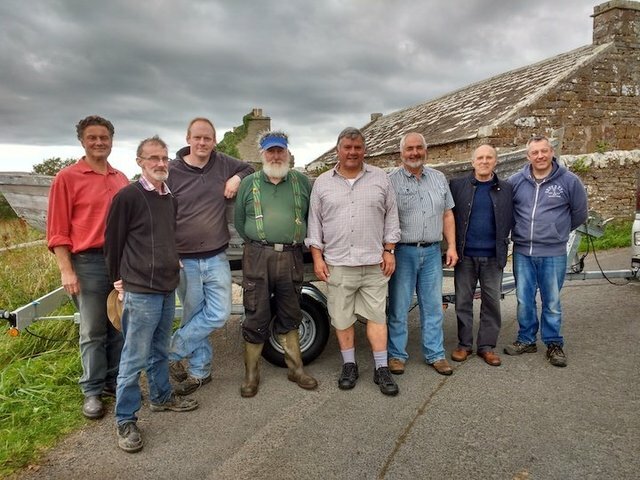 The Annal family made a significant contribution towards the cost of materials to replace the rotten structures and OHBS volunteers providing manpower, supplemented by the professional skills of Ian Richardson. 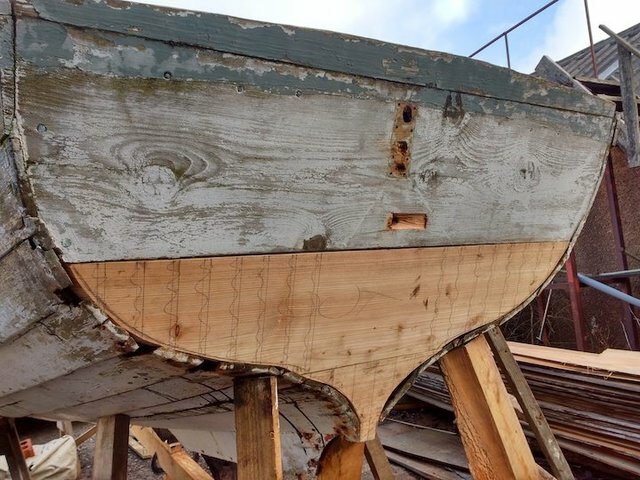 It’s super to see so much work being done on this boat.